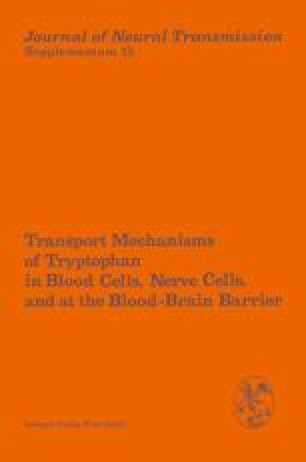 There has been much discussion of the utility of plasma concentrations of tryptophan (total and free) and of amino acids competing with tryptophan for transport to the brain as predictors of brain tryptophan concentration. This issue now may be attaining resolution (Curzon, this volume; Green, 1978; Wurtman, this volume). It appears that large changes of competing amino acid concentrations (e.g. following food intake) have important effects on brain tryptophan while in other circumstances changes of plasma free tryptophan concentration (e.g. when drugs or physiological changes alter the binding of plasma tryptophan to albumin) also have considerable effects. In the past, different groups of workers have focused their attention on experimental situations in which one or other of the above influences were predominant and this has given an impression of a greater polarization of attitudes than was perhaps justified. Also much confusion has resulted from methodological problems and artefactual changes. The following note on methods for the determination of plasma tryptophan (total and free) and non-esterified fatty acid (NEFA) may therefore be helpful.